So here’s something I’ve been holding onto for a good couple of weeks now, and well worth the wait. Perhaps, not what you would have expected from my barely-there behind-the-scenes ‘gram, but voilà – we have my favourite shoot to date, by a fantastic team that I’ve been wanting to work with for a while. And for ELLE.com no less. 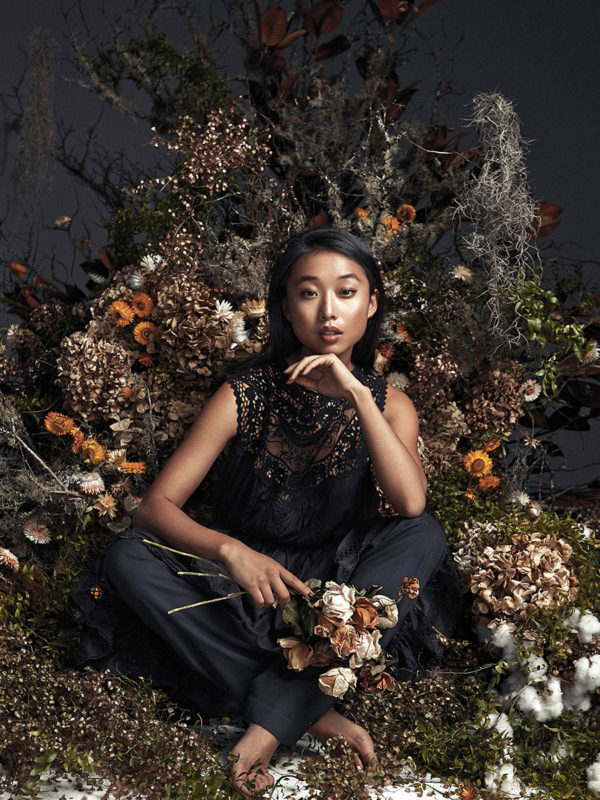 Hell, my job ended up being the least complicated – putting together transeasonal all-black looks (that I’ve elaborated more on in the full story, here), and chilling on a throne of art. *Myra says the key is to take them out of water as soon as they start yellowing at the edges, and keep them in a dry spot like your garage, out of the sun. These shots are beyond amazing! It def says a lot that this is one of your favorite shoots thus, and the third photo of you is one of my favorite ever! Beautiful shots! Beautiful style. Beautiful girl. MARGARET, THIS IS JUST PERFECT. AHHHH. Why are you so beautiful Margaret? All the best for your exams. If there was a babe exams, you would kill it. incredible photos. you are stunning. Always such excitement to see your latest posts <3 You've got it all Marg! Beauty, brains, talent and so much more! I love everything, but my favorite is Look 3 . . . These are gorgeous photos, so incredible. You look flawless! So cool that you are a blogger-turned-model! So you are a photographer, a stylist, a writer, and a model?! So young yet so talented. GORGEOUS! Flawless…that makeup is everything. This is fantastic! I love that you styled it as well as modelling. ELLE must be so pleased! Hey there! So I just asked Myra, and she said that her drying of flowers is purely an accident 99 percent of the time – if she leaves bulb flowers in her van and park it in the sun, in a few days her car will stink but she’s left with beautifully dried anemones or daffodiles, because it serves like a dryer in there. Otherwise, on her first job, she had to dry flowers and frame them for brides, so she ordered bags of Silica gel crystals, which is probably the best and fastest way because the gel absorbs all the moisture out of each bloom – works great for sunflowers (you need to fill a shoe box with a layer of this then place your flower heads in, then cover them with the rest of the gel – place in a dry dark place and leave for a few weeks). Hairspray after the flower is dry will help keep the petals on. Hope that helps! Oww.. thank you sah much beautiful! Will try this.. ee! X best of bestest with exams =) (*rolls eyes.. still don’t know how you juggle so much and all at the tender tender age of 21) . Everything is beautiful and oh-so-moody, love it! These shots are breathtaking. Love the tone of these photos. And you look absolutely stunning in these sophisticated outfits! You’re such a true model! This is ridiculous. How did you style and model at the same time! Congratulations on ELLE. IMG must be loving you right now. Are you now signed to WME too like Bryanboy?? I love your style. I’m looking for a tan leather skirt which siren shoes had on instagram.